China's year-on-year import growth will slightly slow down next year as a result of the skyrocketing growth this year, Chinese experts said on Sunday, but it will still expand at a relatively fast speed with the government rolling out more measures to boost the sector. Experts commented at a time when the government is ramping up efforts to increase imports, including running the second China International Import Expo (CIIE) in 2019. In 2018, China's imports are expected to exceed a record $2 trillion, Song Xianmao, deputy head of the Department of Foreign Trade at the Ministry of Commerce (MOFCOM), disclosed during a national commerce conference held in Beijing on Saturday. In the first 11 months of this year, China imported about $1.97 trillion worth of goods, up 18.4 percent year-on-year, while exporting $2.27 trillion worth of products, up 11.8 percent on a yearly basis, according to customs data released on December 8. Efforts that have been made by the Chinese government this year to boost imports include a reduction on import tariffs on medicines, cars and daily necessities, Song said. Tariffs overall were reduced from an average 9.8 percent to 7.5 percent, he said. Cong Yi, a professor at the Tianjin University of Finance and Economics, told the Global Times on Sunday that he believes that importing tariffs will "continue to fall largely" next year. This will not only benefit domestic consumers, but also stimulate competitive awareness of Chinese companies and benefit the country's supply-side structural reform, Cong said. His view was echoed by Liu Xuezhi, a senior macroeconomics expert at the Bank of Communications in Beijing, who told the Global Times that the government was likely to apply more "zero import tariffs" on a wider range of overseas commodities next year. China has also enriched platforms that facilitate cross-border trade such as organizing the second CIIE. Sun Chenghai, deputy director of the CIIE bureau, disclosed at the conference that the second CIIE's overall exhibition area is expected to exceed the scale of the first CIIE held last month. More than 100,000 square meters of exhibition area has been booked by exhibitors for the next CIIE, he said. 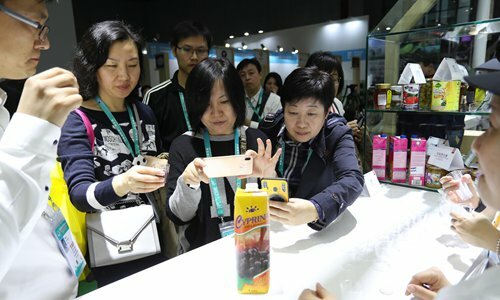 US agribusiness company Cargill, also a participant of the first CIIE held in November, confirmed to the Global Times on Sunday that it had signed up to attend the second CIIE with an even larger exhibition area. According to Liu, the government is boosting imports to reverse the trend of "consumption overflow" in recent years, with many Chinese people traveling abroad for shopping purposes. "Bringing in quality goods from abroad can force domestic companies to upgrade their businesses amidst fiercer competition," Liu said. "It can also help ease China's trade gap which has aroused controversy in the global community." Chinese experts have also noted that China will continue to optimize its import structure next year in accordance with the country's strategy to create a new structure of comprehensive opening-up. "Optimization of the import structure will move toward the direction of better serving Chinese people's increasing need for qualified daily consumer goods and help increase Chinese industry's competitiveness in some fields including technology and clothing," Cong said. Tu Xinquan, a professor at the University of International Business and Economics in Beijing, also told the Global Times on Sunday that imports of daily consumption goods, which currently account for about 20 percent of China's entire imports, will gradually increase over the next few years. According to Cong, imports of resources like petroleum and tourism will also grow as the country's development in the long run needs backing through the global resource system. But Cong stressed that intelligent chip imports will possibly fluctuate under the impact of China-US trade friction. "China may gradually seek self-reliance in developing core technologies," Cong said. China will also likely import more products from the US next year as the two countries work toward consensus in their months-long trade disputes, experts predicted. MOFCOM on Sunday said in a statement released on its website that the vice-ministerial trade talk between China and US made new progress on Friday, while both sides exchanged opinions on topics including the balance of trade and intellectual property. According to Liu, China will likely increase imports of oil and natural gas from the US. The Chinese government recently also announced a suspension in the 25 percent tariff increase on US cars and car accessories. But Liu stressed that China should not and will not import a large number of goods that it does not need either from the US or from other countries just to fill the trade gap.